It used to be that when shoppers were interested in learning about the latest sales from their favorite local stores, they would turn to the printed circulars that came with their newspaper subscriptions. But in the mobile age, people aren’t relying on newspapers as much to get their daily news, and they’re not browsing through printed flyers to find out what’s on sale, either. One company taking advantage of the shift in consumers’ attention from print to screen is Retale, a mobile app that lets you browse store circulars from your smartphone. Today, the company is announcing an additional $12 million in new funding for its business, which now reaches 3.5 million mobile users here in the U.S. The funding comes from Retale’s existing investor base, which includes European media giant Axel Springer SE, and is part of a larger $18 million fundraise for Retale’s parent company, Bonial.com Group. Axel Springer’s plans to invest in the international expansion of the Bonial.com Group were previously announced in March, as the company is now focused on bringing its web and mobile advertising business to the U.S. and other markets. Meanwhile, Retale, too, is now looking toward international expansions of its own thanks to the new funding. “With their impressive media and publishing pedigree, Axel Springer is one of the rare investors to truly understand both the digital and traditional space,” explains Christian Gaiser, CEO of Retale & Bonial as to why the European digital publisher has been a good fit for Retale as an investor. “This is evidenced by the way they’ve transformed their business in just a few years, from 0 to 70 percent digital share. This expertise benefits us, as we continue to enable retailers to transform their most important advertising tool – the print circular which reflects a $17 billion market – for the mobile age,” he says. Retale’s mobile app taps into a user’s current location to display the ads and circulars from nearby stores, including big-name retailers like Macy’s, Kohl’s, Best Buy, Toys R Us, Target, Family Dollar, h.h. gregg, JCPenney, RadioShack and others, as well as select grocery store chains. While Retale does offer a web interface, 95 percent of its traffic today is mobile (phone and tablet combined). The app is one of several (Flipp is another, for instance) competing to be the default replacement for the newspaper circular, as consumers move their weekly shopping planning to mobile devices. Launched in October 2013, Retale’s user base has increased their app visits over the years, Gaiser says. The number of users actively engaging with retailers’ content in Retale is now four times higher than it was last year, he notes, while the number of retail stores’ content has grown to 225,000 during the same time. 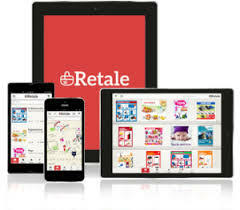 In total, Retale has worked with over 130 retailers. Retale’s partners only pay when users actively engage with the app’s content, so this increase has been good for business, too. Gaiser didn’t detail revenue specifics, but he would say that the company plans to grow revenue by at least 300 percent this year. The company has also already launched a mobile app for the Apple Watch, as it believes there’s potential for the smartwatch to be a source of significant traffic in the future. And the Apple Watch is only the beginning when it comes to Retale’s further investment in wearables. Based in Chicago and Berlin, Retale’s staff has grown to more than 120 people in a year-and-a-half, and the company is now planning to use the funding to hire, especially in product and engineering, and expand to new markets.